Q: What is it like being a part of the Maryland music scene? We have a great music scene, with tons of talented bands doing big things. They’re on tours, releasing lots of CD’s, and opening for big national acts. It’s a great time to be a band in the DMV. Q: What is your favorite song out right now, and why? Wow. ::laughs:: I’m kinda digging that new Foo Fighters track. Not a big Foo guy, but I like it. I also love Twenty One Pilots. I don’t usually like that kind of music, but their songs are catchy. Q: If you could play on stage with someone on stage living or dead, who would it be and why? It would be cool to play with the band Live. They’ve been an inspiration for Ron and I growing up. Q: How did your show at Metro go last time we talked? Oh we had a great response at Metro in Annapolis. That was the first show we played in Annapolis. We’re an Annapolis band, so it’s kind of cool to play where you’re from. The turnout was great. It was cool to see everyone come out from the area and even from Baltimore. The response has been pretty good. We have a lot of views of the snippet we posted on YouTube. It’s done well with streams on Spotify and other websites like that. The podcast ‘Backstage Pass with Meredith Marx’ got the rights to use the song as the opening theme to her show. Shockwave Magazine gave it a great review as well. Q: What is your favorite concert you’ve been to and why? Oh wow. ::laughs:: I was lucky to see a lot of concerts when I was younger because my older brothers. I remember seeing Sublime at Warped Tour back in 1996. The actual original lineup. I would add Korn, System Of A Down, Limp Bizkit, Metallica..I don’t think I can just name one though. 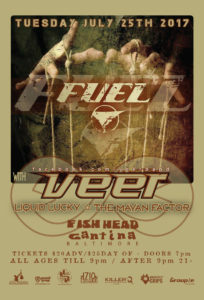 Q: Are you excited to open for Fuel this week at Fish Head Cantina? This is going to be an AWESOME show, probably one of our best ones to date. This is our seventh show, so it’s been fun to play with local artists, Sponge, and now Fuel. It’s the pinnacle right now with this show and trying to finish our album. It should be one hell of a show! 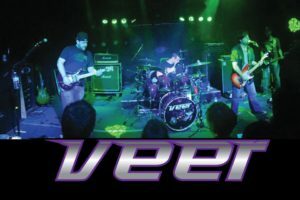 VEER opens for Fuel Tuesday, July 25th!